Ever drifting down the stream — Lingering in the golden gleam — Life, what is it but a dream? 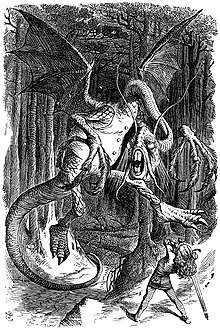 Through the Looking-Glass, and What Alice Found There (1871) is a famous children's novel by Lewis Carroll (Charles Lutwidge Dodgson), similar to his novel, Alice's Adventures in Wonderland. 8 Chapter 8: "It's my own Invention"
10 Chapter 12: Which Dreamed it? "Do you hear the snow against the window-panes, Kitty? How nice and soft it sounds! Just as if some one was kissing the window all over outside. I wonder if the snow loves the trees and fields, that it kisses them so gently? And then it covers them up snug, you know, with a white quilt; and perhaps it says, "Go to sleep, darlings, till the summer comes again." And when they wake up in the summer, Kitty, they dress themselves all in green, and dance about — whenever the wind blows — oh, that's very pretty!" cried Alice, dropping the ball of worsted to clap her hands. "And I do so wish it was true! I'm sure the woods look sleepy in the autumn, when the leaves are getting brown." In another moment Alice was through the glass, and had jumped lightly down into the Looking-glass room. The very first thing she did was to look whether there was a fire in the fireplace, and she was quite pleased to find that there was a real one, blazing away as brightly as the one she had left behind. "So I shall be as warm here as I was in the old room," thought Alice: "warmer, in fact, because there'll be no one here to scold me away from the fire. Oh, what fun it'll be, when they see me through the glass in here, and can't get at me!" "The horror of that moment," the King went on, "I shall never never forget!" From Jabberwocky, st. 1, first shown in mirror writing this is widely considered to be one of the greatest nonsense poems ever written, and has played an inspirational role in many later works by other authors, including "Mimsy Were The Borogoves" (1943) by Lewis Padgett, and the film which was a very loose adaptation of that story, The Last Mimzy (2007). 'It seems very pretty,' she said when she had finished it, 'but it's rather hard to understand!' (You see she didn't like to confess, ever to herself, that she couldn't make it out at all.) "Somehow it seems to fill my head with ideas — only I don't exactly know what they are!" "O Tiger-lily," said Alice, addressing herself to one that was waving gracefully about in the wind, "I wish you could talk!" "We can talk," said the Tiger-lily: "when there's anybody worth talking to." "Never mind!" Alice said in a soothing tone, and stooping down to the daisies, who were just beginning again, she whispered, "If you don't hold your tongues, I'll pick you!" "How is it you can all talk so nicely?" Alice said, hoping to get it into a better temper by a compliment. "I've been in many gardens before, but none of the flowers could talk." "Put your hand down, and feel the ground," said the Tiger-lily. "Then you'll know why." Alice did so. "It's very hard," she said, "but I don't see what that has to do with it." "In most gardens," the Tiger-lily said, "they make the beds too soft—so that the flowers are always asleep." The Red Queen shook her head, "You may call it nonsense if you like," she said, "but I've heard nonsense, compared with which that would be as sensible as a dictionary!" 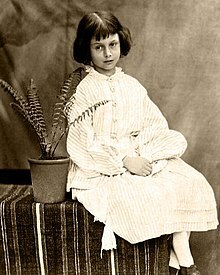 Alice looked round her in great surprise. "Why, I do believe we've been under this tree the whole time! Everything's just as it was!" "Of course it is," said the Queen, "what would you have it?" "Well, in our country," said Alice, still panting a little, "you'd generally get to somewhere else—if you ran very fast for a long time, as we've been doing." Speak in French when you can't think of the English for a thing—turn out your toes when you walk—and remember who you are! "I don't rejoice in insects at all," Alice explained, "because I'm rather afraid of them—at least the large kinds. But I can tell you the names of some of them." "No use to them," said Alice; "but it's useful to the people who name them, I suppose. If not, why do things have names at all?" He's dreaming now... and what do you think he's dreaming about? "He ate more than the Carpenter, though," said Tweedledee. "You see he held his handkerchief in front, so that the Carpenter couldn't count how many he took: contrariwise." Alice said "Nobody can guess that." 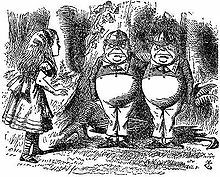 "If that there King was to wake," added Tweedledum, "you'd go out — bang! — just like a candle!" He shouted this so loud that Alice couldn't help saying, "Hush! You'll be waking him, I'm afraid, if you make so much noise." "I am real!" said Alice and began to cry. "You won't make yourself a bit realler by crying," Tweedledee remarked: "there's nothing to cry about." "If I wasn't real," Alice said — half-laughing through her tears, it all seemed so ridiculous — "I shouldn't be able to cry." "I know they're talking nonsense," Alice thought to herself: "and it's foolish to cry about it." So she brushed away her tears, and went on as cheerfully as she could. "You know," he added very gravely, "it's one of the most serious things that can possibly happen to one in a battle — to get one's head cut off." "I'm sure I'll take you with pleasure!" the [White] Queen said. "Twopence a week, and jam every other day." Alice couldn't help laughing, as she said, "I don't want you to hire me—and I don't care for jam." "You couldn't have it if you did want it," the Queen said. "The rule is, jam to-morrow and jam yesterday — but never jam to-day." "It must come sometimes to "jam to-day,"' Alice objected. "That's the effect of living backwards," the Queen said kindly: "it always makes one a little giddy at first." "Living backwards!" Alice repeated in great astonishment. "I never heard of such a thing!" "—but there's one great advantage in it, that one's memory works both ways." "What sort of things do you remember best?" Alice ventured to ask. Alice could not help laughing at this, even in the midst of her tears. "Can you keep from crying by considering things?" she asked. "That's the way it's done," the Queen said with great decision: "nobody can do two things at once, you know." "I'm just one hundred and one, five months and a day." "Feather! Feather!" the Sheep cried again, taking more needles. "You'll be catching a crab directly." 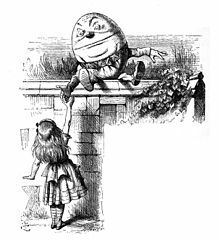 When I use a word,' Humpty Dumpty said in rather a scornful tone, 'it means just what I choose it to mean — neither more nor less. "My name is Alice, but — "
"It's a stupid name enough!" Humpty Dumpty interrupted impatiently. "What does it mean?" "Must a name mean something?" Alice asked doubtfully. "Of course it must," Humpty Dumpty said with a short laugh: "my name means the shape I am — and a good handsome shape it is, too. With a name like yours, you might be any shape, almost." "He's an Anglo-Saxon Messenger — and those are Anglo-Saxon attitudes. He only does them when he's happy." "You alarm me!" said the King. "I feel faint — Give me a ham sandwich!" "Would you—be good enough," Alice panted out, after running a little further, "to stop a minute—just to get—one's breath again?" "I'm good enough," the King said, 'only I'm not strong enough. You see, a minute goes by so fearfully quick. You might as well try to stop a Bandersnatch!" ...and he was going on, when his eye happened to fall upon Alice: he turned round rather instantly, and stood for some time looking at her with an air of the deepest disgust. "What—is—this?" he said at last. "This is a child!" Haigha replied eagerly, coming in front of Alice to introduce her, and spreading out both his hands towards her in an Anglo-Saxon attitude. "We only found it to-day. It's as large as life, and twice as natural!" "I always thought they were fabulous monsters!" said the Unicorn. "Is it alive?" "It can talk," said Haigha, solemnly. The Unicorn looked dreamily at Alice, and said "Talk, child." Alice could not help her lips curling up into a smile as she began: "Do you know, I always thought Unicorns were fabulous monsters, too! I never saw one alive before!" "Well, now that we have seen each other," said the Unicorn, "if you'll believe in me, I'll believe in you. Is that a bargain?" "What a time the Monster is, cutting up that cake!" Alice had seated herself on the bank of a little brook, with the great dish on her knees, and was sawing away diligently with the knife. "It's very provoking!" she said, in reply to the Lion (she was getting quite used to being called "the Monster"). "I've cut several slices already, but they always join on again!" "You don't know how to manage Looking-glass cakes," the Unicorn remarked. "Hand it round first, and cut it afterwards." When you've once said a thing, that fixes it, and you must take the consequences. "But if everybody obeyed that rule," said Alice, who was always ready for a little argument, "and if you only spoke when you were spoken to, and the other person always waited for you to begin, you see nobody would ever say anything, so that—"
"Ridiculous!" cried the Queen. "Why, don't you see, child—" here she broke off with a frown, and, after thinking for a minute, suddenly changed the subject of the conversation. "You look a little shy; let me introduce you to that leg of mutton," said the Red Queen. "Alice—Mutton; Mutton—Alice." The leg of mutton got up in the dish and made a little bow to Alice; and Alice returned the bow, not knowing whether to be frightened or amused. "Make a remark," said the Red Queen: "It's ridiculous to leave all conversation to the pudding!" It is a very inconvenient habit of kittens (Alice had once made the remark) that, whatever you say to them, they always purr. "If they would only purr for "yes" and mew for "no," or any rule of that sort" she had said, "so that one could keep up a conversation! But how can you talk with a person if they always say the same thing?" HTML version with over 170 Illustrations by various artists. This page was last edited on 14 January 2018, at 19:59.